The first shape shown below is a nice open , ringy G 5. To play it you have to stop the 5th string from sounding. The way to do this is to touch the 5th string with the finger that is getting the G note on the 6th string. Play each note one at a time from bottom to top - you should hear; G, dead noise, D, G, D, G.
The second shape shown is even more ringy - good for picking and banjo impersonation. See the tab for some other G 5 shapes. 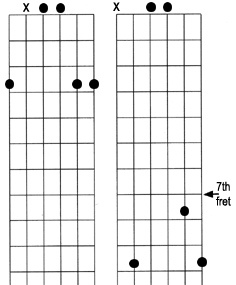 This is another way to get a 6 string G 5 chord - using the left hand thumb to get the note marked ' T ' in the diagram.